The story describes a man; Romero, who has connections and possess a special communication and arrangement with the Centro of the Golden Heights (Armas). The author describes the man as touched despite being a lowly life as portrayed in the eyes of the majority. Society classification has it qualms, and a man who sweeps the streets is, usually, low life based on the status placed on the dwellers of the city. In exchange, Romero gets handout after accomplishing clean sweep of the sidewalks. However, there are individuals in the society who feel for the man. For example, the son of Barela; Seferino offers Romero a wage for his efforts in keeping the sidewalks clean and tidy (Madden). Romero accepts the wage but as time goes by, he starts asking for more. However, he is denied the increase by Seferino and this drives Romero to the edge. He starts living on credit and as things escalate from bad to worse, the man starts stealing. He becomes a nuisance in the city; lifting the skirts of women, and flipping the traffic. However, the behavior of this character as portrayed by the author goes back to normal once Seferino goes back to Harvard. The claim that money changed Romero is an issue open for discussion as evaluated in this paper. I am open to the opinion that money did not change Romero. Initially, Romero cleaned the sidewalks for free. There were not mumbling, or argument and every person looked down on him. Then came Seferino, a man with a big heart and who saw the mistreatment that the society imposed on a man who offered free services and kept the city clean and asked for no wage (Daylover's Blog). The extended offer to give the man a wage was valid and can not only be a just course, but a right he dissevered. Good works should never go unnoticed, and Seferino notices the works of Romero. Arguing and judging that money changed the behavior of Romero is an open argument. The entire arguments being based on the view that an individual has on the society. On one hand, a person who believes in justice and equality will support that Romero deserved a pay and money did not change him. On the other hand, individuals maintaining a high-class society status will oppose the opinion outlining the poor decisions made by Romero after he received payment. Having an obligation and a job gives an individual a sense of purpose. The case of Romero is not different in regard to this theory. Sweeping the cities sidewalks inculcated a sense of belonging to the individual, a purpose and a role to fulfil (Armas). It is the unseen motivating factor that made Romero wake up every day and make the sidewalks clean. It was simply his duty. Despite his commitment, he has been portrayed as an individual with erratic behavior. However, the barrio tolerates his behavior based on the fact that he is a central source of the society which shows commitment and hard work. During all this time, Romero carries out his duty and obligation without a pay. 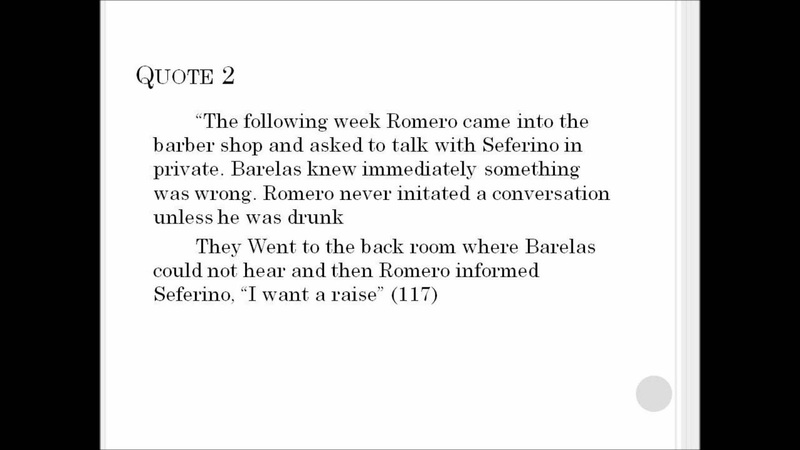 Seferino offers him a wage based on the fact that people have the same concept of money and Romero’s was not different from the others (Saron's Creative Writing Blog). Hard work and self-worth are essential attributes that deserve a pay in the eyes of Seferino. Once he tasted money; the life of Romero changed. He tasted the goodies that accompany better living and money in particular. The wage denial that he had experienced for a long time had created a loophole that alienated him from the good life. Once the wage from Seferino came, part of this hole was filled. However, life had too much to offer that the wage he received could not cover. He desired for more. As a result, he had asked for a raise from his boss. The denial of a pay raise resulted into retaliation. Romero started being reckless and living on credit. From a physiological perspective, this can be interpreted as a way of trying to plead with his boss. On the other hand, such a response can be interpreted differently and seen as a challenge to an individual who has been corrupted by money. In an attempt to defend my view and stand in this argument, I believe that money did not change Romero, the lack of enough changed his perspective. If the money were the root of his actions, he would have gone ballistic after receiving his first pay. The lack of an increase made him change his behavior. Prior to the introduction of money in the equation, Romero can is portrayed as jovial individual. One who sings and sets a jovial mood in the neighborhood. The switch of insanity flips once he starts enjoying the value of money. Despite his abnormality, he possesses a mature and positive attitude towards work. He did it thoroughly and without being compelled or followed. The remuneration that he received was in terms of handouts. During this entire time, Romero never complains concerning the working conditions surrounding his work, and neither does he ask for a wage. The story has a moral lesson; to always let the lying dogs lie. The good-hearted Seferino did more harm than good through introducing money to the individual. It is through his actions that Romero acted in a disrespectful manner and one that imposed the lack of peace in the society. He disrupted the daily ritual of Romero. His contribution to the society was via cleaning the sidewalks. He always took his job seriously ‘he took great care to sweep between the cracks and the sides of the building” (Armas), setting an excellent example to the children in the society. The society consists of individuals with roles to play. Based on the value and level of the individual status in the society, the remuneration levels vary. To some, it may appear unfair and in the case of Romero, receiving handout after cleaning the sidewalks may seem unfair to an outsider (Daylover's Blog). However, it was through this motivation that a peaceful coexistence in a society without havoc elucidate. People place a different value on wages and money and also react differently once they possess money. To some it is not only an essential to living, it is a source of power and recognition. As a tool to these values, the use of it should be accompanied by a sense of responsibility. Romero is a part of a successful society; the individuals care for his wellbeing despite the lack of appreciation in terms of money (Saron's Creative Writing Blog). The most valuable relationship in a society is observed in terms of peaceful coexistence and valuing one another. If the introduction of money in the life of Romero jeopardizes this values, then members of the society are inclined to remove it from the equation. Despite being a villain in the village, Romero signifies a strong work ethic and values the members of the society especially their effort through the band to support him. Armas, Jose. "El Tonto Del Barrio." Harper Anthology of Fiction. Ed. Sylvan Barnet. NY: HarperCollins, 1991. 1137-1142. Daylover's Blog,. 'Summary Vs. Analysis Examples--El Tonto Del Barrio'. N.p., 2012. Web. 15 Oct. 2014. Madden, Frank. Exploring Literature. 1st ed. New York: Pearson Longman, 2009. Print. Saron's Creative Writing Blog,. 'Journal 1: El Tonto Del Barrio'. N.p., 2012. Web. 15 Oct. 2014. The story is describing the personality of the strong man Romero. He worked for the city and country without any wage open heartedly. Get uk bestessay to complete their any kind of work. We should get the inspiration from such people and also follow them to earn a name in the society.